I'm really excited about my new Squarespace website. And whether you're totally finished with your site or just about to start, I can help you maximize the revenue you generate from your Squarespace website. And I can help you harvest highly qualified leads—then nurture these leads. I'm a copywriter... but not just any copywriter. I'm part of a rare breed known as the direct response copywriter. Going to your payment page and pulling out their credit card out and buying. I combine direct response techniques with creativity and convert visitors into buyers. Here's some proof from one of my clients, who is 9,453 miles from my office. Scott Martin is a rare find — a copywriter who understands how to motivate customers to call or get out their credit cards and buy! He has a genuine enthusiasm for great copy, is fun to work with, hits deadlines, but most of all — he gets results! Maybe you've heard of direct response marketing and copywriting... and maybe you think it's a bit 'heavy' for your site. I can tone things down AND write the copy so it gets your visitors taking action. If you want to learn more about the power of direct response marketing, go to my library for free resources. Or see plenty of 'non heavy' samples in my portfolio. Speed. I hear it all the time from web developers, "we can't go live because the copy isn't ready!" Or "where's the copy?" When I start to work with a client, I ask why they fired their last copywriter. Nine times out of then, the answer: "They couldn't meet a deadline." Because I hit deadlines, you hit deadlines and because the site is ready faster, you can generate revenue and leads sooner. And when the site goes live my copy will improve your conversion rates. See actual samples of high converting copy on my portfolio page here. The sites that you, the Squarespace community, create are phenomenal and some of the most visually stunning sites I've seen. It's a testament to the platform, its flexibility, and your talent. BUT these sites need a bit more commercial oomph so the site is not only a visual success, but a commercial success. The site can look good AND help you make some money. The biggest mistake is creating a Squarespace site that doesn't maximize its commercial potential. The key is the copy. If you're writing it and you're not a direct response copywriter, you will NOT maximize conversion and revenue. However, if you hire a copywriter with proven ability to turn readers into buyers then you're going to earn more business. 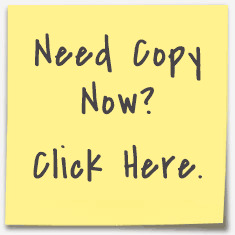 For a sensible fee, I can assess your current copy, recommend changes, then write new copy. One of my clients is Australia's top Internet lead generation experts and I use his techniques and strategies...and they work. And I can also provide ideas so people stay on your beautiful site longer. And if they stay longer, visitors are more likely to buy or contact. Contact me here for a FREE 30-minute consultation about your website's content and copy. And subscribe to my blog for frequent marketing and content ideas. You can subtly infuse direct response copy into your site to persuade visitors to take 'the next step' so you generate leads and revenue. If you have ambitious financial goals for your site, contact me here now. And remember... people go to your website to READ and learn. If you get the copywriting and content correct, you can turn the readers into customers, many with a lifetime value of more than $10,000. P.S. What's in it for you? You'll spend a lot less time looking for a copywriter (it can take days). I'll give your site some marketing 'oomph' so it's more likely to make money and create leads. I'll meet deadlines so the project keeps moving forward.